Who actually has time to exercise? As life gets busy, taking care of yourself is usually the first thing to move to the back burner. But to help you out, we looked at the average work day, and realized that there’s lots of potential for exercising at work, you just need to get a little creative. 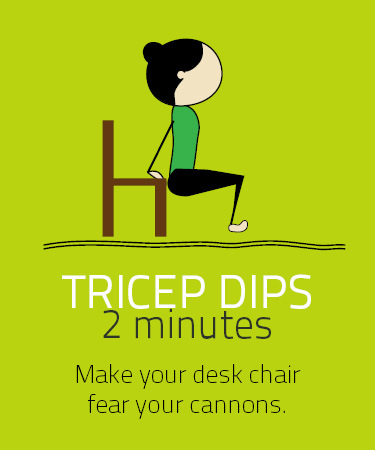 This infographic has a series of circuits that will get your heart pounding at your desk. Good luck, and let us know what you think of the plan. Every day I park in the furthest away spot so I can at least get some walking exercise going to work, to lunch, and running errands. Hi there, You’ve done an eexcellent job. I’ll definitely digg it and personally suggest to my friends. i WOULD LIKEA POSTER OF THIS ALSO. WILL NOT PRINT. I think this site is AMAZING! I am doing an internship right now in Employee Wellness and would love to have a printable poster of this!! Do you mind sending me one? Reblogged this on Kenny Weigandt.